For fighter info, see Isabelle (SSBU). Official artwork of Isabelle from Animal Crossing: amiibo Festival. 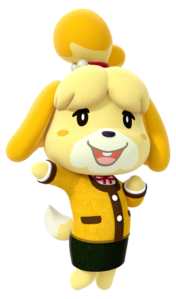 Isabelle (しずえ, Shizue) is a major character from Animal Crossing: New Leaf. Isabelle as she appears in Animal Crossing: New Leaf. 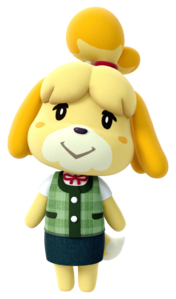 Isabelle made her debut in Animal Crossing: New Leaf as the Mayor's eager, although sometimes scatterbrained secretary. Slightly naïve but nonetheless hardworking, Isabelle tries to do anything to please the mayor. Her duties as the mayor's secretary involve aiding the player in signing ordinances into law, making preparations for public works projects, and officiating various ceremonies. On numerous holidays throughout the year she appears in the town plaza, giving out themed items to players who speak with her. Following her debut, Isabelle quickly became the primary poster child for the Animal Crossing series, with promotional material featuring her far more prominently than other major characters such as Tom Nook. Isabelle appears in several major roles. Isabelle throwing fruit to Ryu. Isabelle stays in place, tossing healing fruit to the player who summoned her. While it is possible for opponents to intercept the fruit, only the summoner has the advantage of only having to touch the fruit to heal; opponents will have to actively grab them with the shield or attack buttons. While Isabelle cannot be attacked, she will flinch if opponents get close. If the summoner is KO'd while she is still out, she will hunch over with a dismayed expression until the player returns. Conversely, she will cheer if her summoner scores a KO. Isabelle appears as an item in Smash Tour: when selected, all stat boosting items near the player grow to their maximum size. A Mii Gunner dressed as Isabelle. Isabelle is the basis for a paid DLC costume for Mii Gunners. Instead of a gun, Mii Fighters wearing the Isabelle costume use a party cone to attack. Isabelle's standard trophy can be obtained in both versions of Super Smash Bros. 4, and in Super Smash Bros. for Wii U it is part of the Animal Crossing: New Leaf Trophy Box. The variation in her sweater outfit is only available in Super Smash Bros. for Nintendo 3DS. Isabelle is the mayor's highly capable secretary. She can be forgetful sometimes, but you can always count on her for information about the town. She wears her hair up in a bun that makes her look like a shih tzu. Mostly because she is one! She also has a twin brother named Digby. Isabelle's the mayor's secretary, and you couldn't ask for someone more on the ball! Well...maybe you could, but she's still full of useful info about life in the town. With her fringe and tied-up hair, she looks just like a shih-tzu! That's because she is one. And so is her twin brother, Digby. The green check she wears in warmer months suits her perfectly, but when the cold hits, her mustard-yellow cardigan is just too stylish for words. It may make you long for the spring months, though. Hot or cold—nothing makes Isabelle feel under the weather! The green chequered vest she wears in warmer months suits her to a T, but when the cold hits, her mustard-yellow cardie is just too stylish for words. That said, it might make you long for spring and all its vibrant beauty! Of course, Isabelle doesn't mind. Hot or cold, she's always a ray of sunshine! Isabelle's appearance in Super Smash Bros. Ultimate. Isabelle was confirmed to appear in Super Smash Bros. Ultimate as a playable character on September 13th, 2018 during the Nintendo Direct. Her moveset in general shares many moves with Villager, though she is not categorized as an Echo Fighter, instead being a semi-clone. Isabelle in Super Smash Bros. for Wii U, from her reveal picture on Miiverse. Isabelle in Super Smash Bros. for Nintendo 3DS. Isabelle as an item in Smash Tour. Villager's reveal poster, featuring a cameo of Isabelle. Isabelle's Winter outfit in Super Smash Bros. Ultimate. 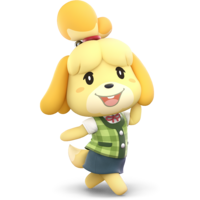 Isabelle is the fourth assist character in the series who is playable in a later installment, the first being Charizard, the second being Little Mac, and the third being Dark Samus. As in the case with Little Mac and Dark Samus, she is the third Assist Trophy character with this distinction. With her debut on November 2012, Isabelle is the newest Assist Trophy in Super Smash Bros. 4. The pear is the only fruit she throws that doesn't appear in her trophy in Smash 4. Isabelle and Villager are the only playable characters in the Super Smash Bros. series whose Japanese names are written entirely in hiragana, as opposed to katakana. Despite normally having a voice in her appearances and even having one in her reveal trailer, Isabelle remains mute in her appearance in Ultimate. This page was last edited on March 1, 2019, at 01:08.